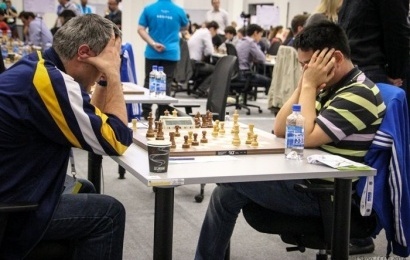 Signs of accumulating fatigue or shaky nerves could be seen as Round 9 of the 2014 Chess Olympiad headed towards the first time control. New hope for the Chinese women's team gold medal chase appeared as top board Kateryna Lagno was the first to crack in Russia's tense match against number 10 ranked Armenia… although there was eventually a happy ending for Team Russia. It was also tight in the men's event, as 9 of the top 14 matches finished drawn.